Golden Demon Baltimore 2009 results are in. One which caught my eye is this amazing Tau golden demon diorama. I can't believe such a dynamic scene only won silver! I laughed when I saw the Tau Piranha doomed to crash and burn while the Tau crew are being torn apart by a Tyranid Lictor. The guy in the back seat is brilliant too as black smoke belches from one of the engine pods. They're going down fast and it's not going to end well...not for the driver anyway. 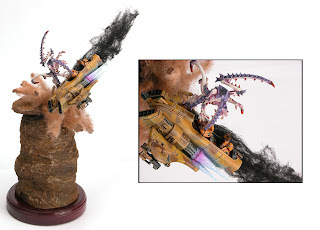 Of course, the Lictor is going to leap clear before the crash and probably be alright...or make a large purple splatter along with the plumeting Tau Piranha as it explodes on impact. Brilliant scene which tells a story, but only gets Silver. Ah well. If you can't tell, I love/hate Lictors. Awesome models, loads of character, but a real nightmare for any Tau player, unless you chuck a load of stuff in terrain in the centre and just sit there to make sure it doesn't appear amongst your forces. I need to call up Munky for another game against his Tyranids. you can see all the Games Day Baltimore Golden Demon winners here. Note: Yes, the link does work. Just select your country and it will show take you to the right page. Damn GW and their silly redirect. Damn that is epic, I have to find out what won now, must be beyond epic. OMG that's cool as hell. But in MY mind, the driver pulls out a bonding knife, stabs the Lictor in the eye, yanks up on the control stick and gets the Piranha under control just long enough to steer it into the face of a Hive Tyrant. The Lictor, scrabbling around on the hood, turns and sees the boss just before impact. Doh! The driver and gunner survive the crunching impact due to the superior Tau seatbelt/side-impact airbag technology. They crawl out of the wreckage and high five each other. OK, maybe not.... but still, that is one cool diorama. I saw that the 40k single mini gold winner was a Kroot Shaper! Point for the Tau!